The first thing that will catch your eye about Raging Rhino Slot is instead of the normal 5 reels it has 6. This slot is another amazing recently released addition to the Williams Interactive portfolio. Not only does Raging Rhino look great, it has enough differences from regular video slots to feel fresh and entertaining – even to hardened slots fans. 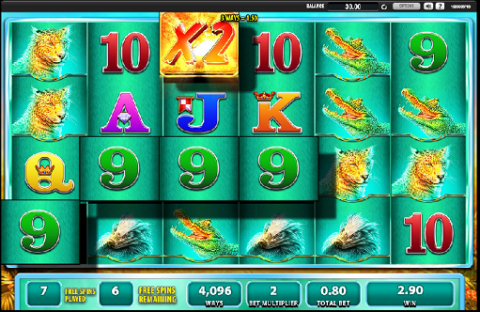 This page gives you a complete guide to the WMS Raging Rhino slot game. I have first covered the game basics and setup of the slot. After this you will find information on what happens when you land the excellent bonus feature. After that I have given my opinion of the Raging Rhino slot compare to other online slots. Williams Interactive slot games are not currently available at US friendly casinos. US readers can see this US Slots Guide for some great alternate choices. Raging Rhino slot is a 4096 all-ways pay out line non-progressive video game, with 4 rows of symbols and 6 reels. This means that instead of traditional win-lines, any combination of symbols from left to right (starting in the left hand reel) counts as a win. This does sound strange in print, however once you get used to the fact that the symbols do not need to be on specific lines, it is very easy to see the wins as they come in. The game is cantered on the picturesque savannahs of Africa. When you enter the game the reels are cantered in the middle of the screen and as soon as you start playing they expand, covering the beautiful orange-soaked savannah landscape in the background. Another nice feature is that when you hit a winning combination the symbols rise out of the reels like 3D blocks. The higher value symbols are a Rhino, a Cheetah, a Monkey, a Mongoose, a Crocodile and a Baboon. The lower value symbols are the Ace, King, Queen, Jack and Ten. The wild symbol is a native Baobab tree silhouette against an orange sunset – the wild symbol only land on reels 2 - 6; there’s also a big diamond which triggers the bonus round. The minimum bet per spin is $0.40 and the maximum is $80.00. Williams Interactive has managed to create an atmospheric feeling to go with this slot. The constant stream of smaller wins will keep you from drifting too far away while playing it. In some ways this reminds me of MicroGaming's Mega Moolah - only with a green theme instead of orange. The Raging Rhino bonus round is the possible big payer of this slot. Although the slot has only 1 bonus round there is potential to increase the round to last longer and give more pay outs. The big, sparkly diamond is the scatter symbol and when you land 3 or more of these symbols you trigger the bonus free spins round. When the scatter symbol lands 3 – 6 symbols you first get the scatter pay out which can be up to 80,000 credits with all 6 symbols, after that the free spins are triggered. For 3 Diamonds you get 8 spins, for 4 diamonds 15 spins, for 5 diamonds 20 spins and for 6 diamonds 50 spins. While you are in the free spins round you can receive more spins if you hit 3 or more scatters again, this is unlimited. During the free spins round if you land wilds they will trigger multipliers of the winning combination by 2x and 3x. A nice feature is the bonus guarantee, which sets a minimum (based on your spin amount) which you will hit if you do not land enough wins in the free spins round. How Does This Slot Compare to Standard Slots? When you first read that Raging Rhino Slots has 4096 ways to win with 6 reels and 4 rows of symbols. This does take a few spins to get used to, though like to 243-ways games is very easy once you become familiar. This slot does not have the intensity of some of the more interactive modern slots. It will stay in many people’s favourite list as one to play when you feel like relaxing with a few spins. The pay-out can still be substantial though! Raging Rhino is an amazing online experience, it is possible to play online in your web browser both in PC and Mac. Williams Interactive now has a cutting-edge mobile platform which because they are using HTML5 technology means that Raging Rhino slots is available to enjoy on both your Android devices and iOS devices.